Meet Emily Wallace. 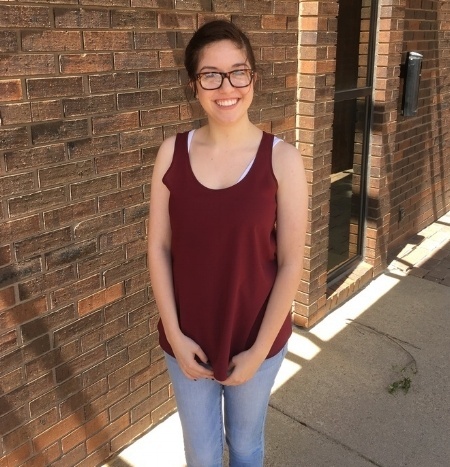 Emily comes to us from Northwestern College and is a creative content intern this summer at 5j Design. She is one of two interns that is joining our team for these next few months. We are so excited to have her on board and we wanted her to introduce herself to you all. Hi! I’m Emily Wallace, the second intern here at 5j Design. I am a senior at Northwestern College in Orange City, Iowa where I major in graphic design and minor in journalism. I am from Tucson, Arizona and this summer is my first opportunity to explore the Sioux Falls area! I love getting to live in many different environments, from southern Arizona, to the Pacific Northwest, to the tundra of the Midwest every new location is a new adventure. I am recently engaged (yay!) to my boyfriend of six years, TJ, and we are planning our wedding for next summer after we both graduate college. In my spare time I attempt to cook complicated ethnic foods, and, more often than not, I fail. I love camping, road trips, obscene amounts of coffee, painting, Alfred Hitchcock movies and big fluffy blankets. I’m very excited for what this summer holds for me in Sioux Falls and at 5j Design! Look to hear more from Emily and Alli this summer as they share about their experiences and all things related to web design, inbound marketing, and graphic design!